#StackBounty: #jsf #primefaces How to reset p:dialog together with the disable-state of the contained components? I need to reset the initial disable-state of components contained in a p:dialog. // reset disable-state of the disable-state of all components in a generic way. While using the dialog the p:inputText element can be disabled. If the dialog was canceled and opened again, inputText should not disabled. The initial state should have been restored. Please note that this example is simplified and i am looking for a general solution that also works with a formular with 10+ input elements. Oracle Application Development Framework (Oracle ADF) is an advanced Rapid Application Development(RAD) Framework for J2EE applications mainly targeted for B2B Applications. Separation of Business Logic implementation details, via metadata and use of this metadata-driven architecture enables developers to focus on the business logic and user experience. Drag-n-Drop features, via JDeveloper IDE, provides the ease to use and customize. ADF Faces and Data Visualization Tools (DVT) support touch gestures for interactivity on the touch-enabled devices, such as touch support for drag and drop, tooltips, data tips, and context menus. ADF Faces and DVT components are certified on iPad. Additionally, ADF DVT Graph and Gauge components support rendering in HTML5. MDS is metadata service that is used to store metadata information. 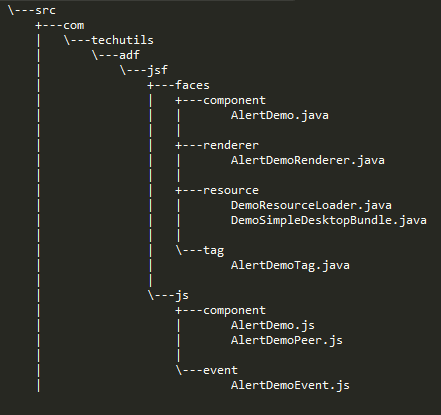 When you use ADF, it generates lot of internal files about its own components and DB binding details. All these are stored internally by ADF into MDS. ADS (Active Data service)- This is used in ADF to push any data changes automatically from the back end into the portal layer. This is different from Ajax which is used to send request from UI to data service layer. In this tutorial, we will create a custom ADF Component. The Preferences tab will be seen as shown. create a new tester project.